I wasn’t planning on writing my own predictions this year – it just so happens that I was asked to respond to future-looking questions as part of an RFI response. – and I thought that the initial conclusions from this exercise were worth sharing. My hope is to use this post to spark an open discussion on the subject and get more feedback from my friends in the community. 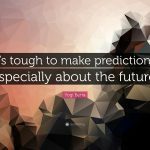 Hopefully, with the addition of the “wisdom of the crowd”, it could turn into a more educated prediction piece and thus be more useful to everyone. Last year I wrote about the Amazon Effect on open source and the way it shapes the relationship between cloud providers and the open source ecosystem. I concluded that the dominance of Amazon and the cannibalization strategy that it took with some open source projects, led to an interesting dynamic with the rest the industry. This dynamic is quite analogous to the one between iPhone and Android. In this case, the cloud-native ecosystem centered around Kubernetes takes the Android equivalent role – they’re both from Google, too. In 2019 I expect that we’ll see Microsoft doubling down with their open source which led strategy to distance themselves from AWS. This open source led strategy will apply not just to small utility projects but also to drive their core infrastructure projects. Sean McKenna, Principal Program Manager of Azure Cloud Native Services, provides an interesting insight in his post – Bringing serverless to Azure Kubernetes Service, which points to Azure’s strategy to support Kublet as their new serverless engine while at the same time contributing it back to the cloud-native ecosystem. Similarly, open source is also used to unlock the next generation of networking infrastructure. In this case, open source is basically replacing the slow standards-led process with a more agile community-led process backed with actual implementation. It’s interesting to see that these projects are also aligning themselves with the Kubernetes ecosystem. ONF has adopted Kubernetes as the underlying platform and architecture for managing next-generation virtual access (SEBA etc.). Akraino uses Kubernetes as the base platform for network Edge. ONAP uses Kubernetes as the management platform (OOM) for ONAP itself and as a potential target infrastructure for running and managing network services. Both ONF and Akraino plan to integrate and extend on ONAP so it is likely that ONAP will become the umbrella project for all other networking sub-projects and as a result will become even more aligned with the cloud-native architecture. I believe that in 2019 we will see an even stronger alignment of those projects with the Kubernetes ecosystem. It remains open to see the effect of cloud-native architecture on. OSM follows the ETSI specification. The ETSI specification tends to be very infrastructure-centric and is, therefore, more likely to be disrupted by this move. The number of open source networking projects continues to grow, leading to more fragmentation and overlap between some of those projects, which eventually slows down the maturity of NFV. I expect that in 2019 we’ll see a stronger push by CSPs and the rest of the industry toward vendor backing of those projects as a mandatory requirement to get into their network. …an increasing amount of the revenue stream is coming from higher level services, ranging from databases and datastores to AI machine learning training to higher order things like Lambda functions, which are extremely nascent. 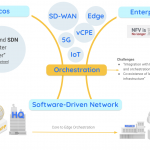 To understand why orchestration has become such a crucial piece in NFV transformation, we need to understand the shift in the way we control the network in a static network services world versus a virtual networking world. In a static networking world, the main way to control traffic flow was by controlling the packet flow between those services. Many of the traditional network services such as routers, firewalls, and load balancers were built under this assumption. As we move to a more distributed environment where the network becomes software-defined and dynamic, the packet-centric control over the network becomes too granular and low level to allow effective control of the entire network. In this context, the control point shifts from controlling packets to controlling the entire end-to-end service. Orchestration provides that high order control point and thus brings immense value to the business, in terms of automation and agility, much higher up the stack than the traditional network services. Another point that is leading to the strategic importance of orchestration in the overall digital transformation path is understanding the role that automation plays in delivering new value-added services faster. The reason AWS grew so rapidly is because they were able to launch many new value-added services quickly. They wouldn’t be able to do that without a good, flexible automation engine behind their entire operation, and this is another area where orchestration becomes critical to the overall digital transformation journey. The continuous disruption that we witnessed over the recent years will intensify due to broader adoption of open source and cloud-native platforms as the two reduce the barrier for innovation, as I noted in my post Why Do I Need * If I’m Using Kubernetes?. I expect that in 2019 we will see an even stronger shift toward new, disruptive architectures with technologies such as serverless, service-mesh, and edge gaining more adoption. To be able to sustain in this environment, organizations will have to adopt agile practices to integrate new technologies without consistently breaking their existing environment. Adding a common automation layer that will be able to put all those new technologies together under a common automation scheme is one way to handle this – an approach I call “automation first”. It’s no secret that enterprises and telcos alike need to bring data and processing power as close to the consumer as possible with the sheer number of mobile devices expected to jump into the tens of billions in the next two years. The next big disruption I see is expected to be in the areas of virtual access edge and Internet of Things (IoT). The move to virtual access edge devices as part of the move to desegregation of the stack (separation between the control and data plane) is expected to open up the market for a new set of players. The adoption of open source and cloud-native led strategy for delivering the next generation virtual access also opens the door for more generic management and orchestration across all the different types of access devices. This new virtual access stack can provide a common management platform for virtual OLT as well virtual RAN. Many of the existing SD-WAN solutions were originally built on a proprietary stack. With the maturity of new virtual access frameworks, we will see a move to more open SD-WAN solutions. The move to common virtual access management is a major shift that will allow better synergies between those platforms traditionally managed as complete silos. That will, in turn, allow CSPs to finally deliver on the NFV promise of delivering faster, innovative services to their customers. Similarly, IoT spending is expected to hit $745 billion in 2019 according to IDC. 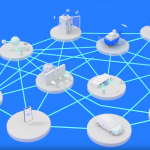 The move to IoT imposes a unique set of challenges in the way we handle scalability and deal with network vulnerabilities. The unique challenges of scale and network vulnerability compel many experts of the current network management and orchestration platforms to see them as pretty much obsolete. This will open the door for a new generation of orchestration and management paradigms that will be based on a more federated architecture built out of many micro orchestrators acting as an autonomous unit of manageable scale. 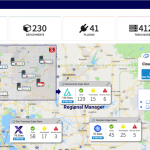 These micro orchestrators will coordinate the workload management between themselves based on geography, capacity, etc. You can find an initial reference on how such federated platforms will look like in one of my previous blog posts. Stay tuned for a more dedicated post on this topic in a follow-up post. In this post, I tried to cover a few of the major trends that are shaping the cloud automation and orchestration industry, as well as enterprise and telecom businesses as a whole. Open source will be used to unlock the multi-cloud and networking stack. We’ll see Azure and Google will focus more on an open source led strategies to differentiate themselves from Amazon. Fragmentation of many of the current open source projects will slow down the maturity of NFV. The attempt to accelerate the maturity of those projects, by forcing vendors to back them, is not going to be enough and there is a need for more serious thought by carriers about how to strike a win/win business model in a way that will open the game for new disruptors to enter the game. A good starting point would be to follow Azure and Google open source led strategy. Orchestration is being recognized as a key technology enabler for digital transformation. The growing adoption of open source and cloud will intensify the continuous disruption and therefore organizations must adopt agile practices that will allow them to adopt new technologies faster, without continually breaking their systems. An automation first approach is one method to achieve that. The next big disruption is expected in the areas of Edge computing and IoT as it forces a new paradigm shift in the way we think of managing billions of devices at scale. This will lead to an introduction of next-generation orchestration platforms. I would like to finish with a note. As we are drawing our future, we need to be sure not to underestimate the transformation challenge of large enterprises and carriers from their existing environment, and that’s why 70% of digital transformation projects still fail. It looks like the big cloud providers already realized that, as indicated based on the recent acquisitions of CloudEndure by AWS and Velostrata by Google. So, as we are thinking about the next generation platforms, we also need to think about how they connect and integrate with networks and environments to allow for a faster transformation. Why Do I Need * If I’m Using Kubernetes?.